Keep an eye on your most important topics. How do you approach your issues? PANALIS Monitoring Starter Edition is designed for Single Consultant, who wants to pursue a political Monitoring and focuses on a particular political topic. It is in a way the PANALIS Edition for all single user and person, who wants to test PANALIS Monitoring for their team. PANALIS Monitoring Starter Edition allows to create up to two lists of Topics and two Stakeholder Groups , that can be monitored by the user. That is why PANALIS Monitoring Starter is especially suitable for specialized and focused individual users. In addition, PANALIS Monitoring provides you the full range of information. Free support is included in the PM Starter Edition, as well as in all other PM editions. 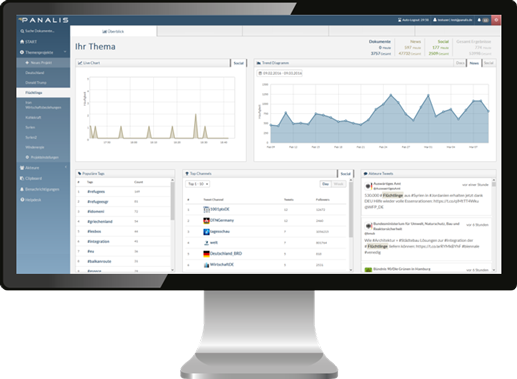 If you want to use PANALIS Monitoring with multiple person or if you are interested in more than one political topic or if you want to use the more advanced PANALIS features (such as the implementation of your own sources), we recommend that you inform about our other PANALIS Editions. Feel free to contact us for more information or to arrange an appointment for a free webinar demonstration of PANALIS Monitoring.